Join us for West End Weekend! 3. Enter our West End Raffle! 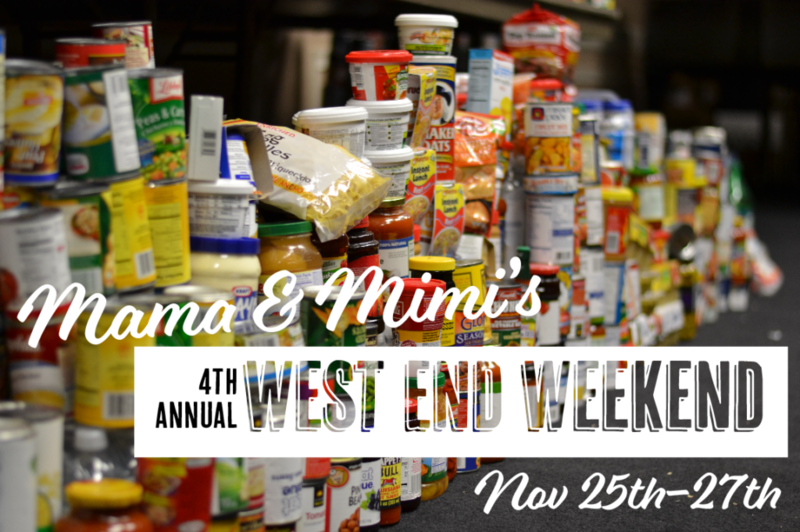 Anytime throughout the 3-day weekend (this Friday, Saturday or Sunday), we invite you to bring canned goods or other non-perishable food items to either Mama Goose or Mimi’s Attic and contribute to our Rescue Mission Food Drive. You will receive a raffle ticket for each item you bring AND you can choose which prizes you would like to try to win. The more food items you bring in, the better your chances are of winning a prize! Below is a list of our fabulous West End neighbors who have donated exciting gift certificates and prizes to our raffle! And of course the Grand Prize!!! We will draw the raffle winners on Tuesday November 28, 2016. This sale applies to everything in the store – including new items like our Primitive Artisan dishtowels and already reduced and clearance items. $5 OFF COUPON for December! Posted in Uncategorized	| Comments Off on Join us for West End Weekend! This year’s Wizarding Weekend was full of surprises! Witches and warlocks roamed the streets of downtown Ithaca amongst balloon animals, Butterbeer and broomsticks. Our furniture vignettes in Press Bay Alley were a crowd-pleaser and drew in the city’s biggest Hogwarts enthusiasts. Put all ingredients (excluding whipped cream) in a pot on the stove. Heat on medium-low while stirring until frothy. Serve with a generous helping of whipped cream. Drink after a long day of casting spells. Posted in Uncategorized	| Comments Off on Wizarding Weekend 2016 recap!